We must reduce our volume to the simple evangelists, select, even from them, the very words only of Jesus. There will be remaining the most sublime and benevolent code of morals which has ever been offered to man. 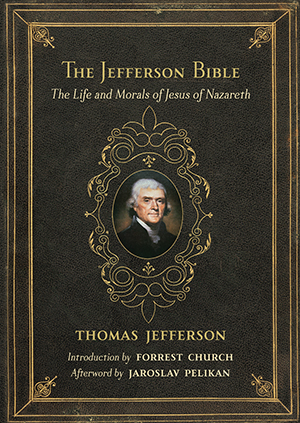 Featuring an introduction by Forrest Church, this reissue of The Jefferson Bible offers extraordinary insight into the logic of Thomas Jefferson and the Gospel of Jesus. Working in the White House in 1804, Jefferson set out to edit the Gospels in order to uncover the essence of true religion in the simple story of the life of Jesus. Jefferson was convinced that the authentic message of Jesus could be found only by extracting from the Gospels Jesus’s message of absolute love and service, rather than the miracle of the Annunciation, Virgin Birth, or even the Resurrection. Completed in 1819, this little book is the remarkable result of Jefferson’s efforts.